We are committed to having great low prices everyday and we guarantee it. So if you find the same grade doors, warranty and shipping costs from another internet dealer, at a lower price, upon verification We will beat the price. If your looking for a roll up door, garage door, commercial door, shed door or barn door. We have several staff members ready to answer any questions that you may have. We can also take your order over the phone. Toll Free Phone 1-877-753-6677 To Order Thanks for your business. The next generation available today... where you get more for less. We are glad to have you on our website, and even happier to demonstrate why our products are the state of the art highest performance on the market today. We are a US based company that specializes in making roll up, commercial garage and wind load rated doors and would like to tell you about our line of products. Thousands and thousands of our units are in operation all over the world, every day of the year. Our roll up doors, commercial roll up doors and garage doors are special because they are made of good quality components. Delivering a high quality, cost effective product is our standard and that is just why our units have been chosen by many companies, small and large. In the 10 years that we have been in business we have made a good name for ourselves in countries around the world. Explore our site and get an even more in-depth view of our product range in real world conditions. Through our web site you will be able to see our price list and brochures. In need of a single unit for your shed, building or supplying a complete mini storage facility, we can ship any amount directly to your job site. Commercial, Heavy Duty, Wind Certified designed to 150 mph wind, we can deliver from several strategically located plants in Orlando, FL. Mesa, AZ. Temple GA. Anaheim, CA. Butler, IN. Houston, TX. Made In The US. Ready To Buy Go ToStep 5 . Step 1: Measure your finished frame. Step 3: Find delivery zone. Step 5: Order correct size. We can supply you with a selection of units from major manufactures at discount prices. Our prices are for a boxed ready to ship unit (shipping depends on garage door size and zip code). All our units come complete with frame, fixings, mounting brackets, tension or reduced drive chain, lock/latch system in any of 22 colors. Garage systems from Clopay and Wayne Dalton. Light use and medium use metal units. Heavy Duty Wind rated units inc. Dade county approved. Sizes up to 20ft wide and 16ft high. Also medium to heavy duty commercial doors. If you would like to place an order or receive more information, please use our web site, or contact us by telephone. Interested in learning more and seeing our fantastic selection? Simply visit our website today to start shopping! Your source for doors. ( Period ) If you need a door, no matter what kind it is we’ve got it for less! We are Doors Direct. We work directly with Manufacturers, allowing us to reduce expenses. We are pioneers of the direct-to-the-consumer approach, And we can offer our customers great service as well as Substantial savings. At Doors Direct we have a beautiful and large selection of styles to choose from! 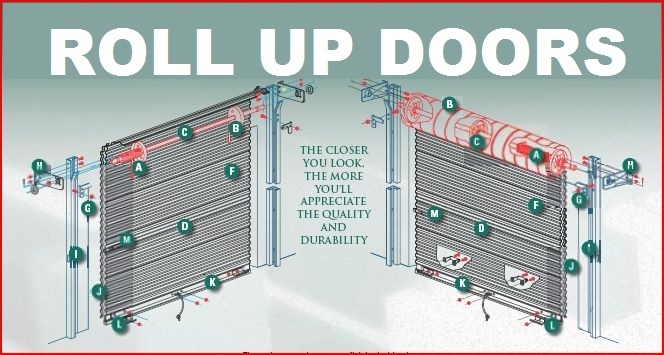 Whether you are in the market for a new garage door, Roll-up-door, roll up shed door, roll up barn door or a commercial door, Doors Direct has the variety And quality to suit your needs! We’re so confident our prices can’t be beat, we guarantee it! We offer a Low Price Guarantee on all in-stock merchandise. Just compare our total price—item price + tax (if applicable) + shipping & handling to the total price of other online stores. If you find a lower price, we will match the price and refund 10% of the difference! Just call or visit our awesome website to begin shopping! DOOR SPRINGS: During production, each spring is coated with a generous amount of grease that penetrates the innermost pores of the spring with additives, displacing moisture and preventing the formation of rust and corrosion. In addition, this process relieves the friction created between spring coils, thereby providing a smoother door operation. Finally, the spring and axle assembly is enclosed in a tube to protect them from the elements encountered throughout the life of the door. OPTIONAL PACKAGE PROTECTION & SHIPPING: Doors stacked on top of each other in transit are going to shift… unless they can be packaged in a way to minimize the sliding that occurs during that time. Janus has found the way. As an option, we can suspend each door individually in crates. Whether they travel down the block or across the country, compaction damages, door abrasions and chatter marks are virtually eliminated. RATCHET TENSIONING DEVICE: The ratchet tensioning device, supplied as standard equipment on our door, offers a simpler method of tensioning while more accurately fine tuning all the springs on the door at the same time. There is no extra hardware required. Eight different positions on the tension wheel allow one to perfectly balance the door every time. There are no pins required to hold the tension on the spring… you simply just click it. RADIAL BALL BEARINGS: Roll Up Doors Direct supplies radial ball bearings at no additional cost to you. Our permanently-lubricated bearings require no maintenance and are guaranteed to last the entire life span of the door. DEAD AXLE & TORQUE TUBE ASSEMBLY: This design, noted for its durability and smoother operation with commercial applications, has now been incorporated into the Janus self storage door. The tube housing protects the springs and strengthens the axle. Eliminating axle push and shift that can occur with a live axle, the dead axle design allows for a straighter travel path of the door curtain in the guides. The greatest feature of this design is that it affords the fine tuning of any spring adjustment to equally affect all springs on the door at the same time. MAGNETIC ZINC COATED STEEL OR OPTIONAL STAINLESS STEEL LATCH: Our patented mini latch features a cover plate made from a heavy gauge yellow zinc coated steel or optional stainless steel. In addition, the latch cover protects the slide from tampering by completely covering the slide, with the exception of a tab used to operate the latch. To further secure the door, the latch’s two inch throw, with its magnetic properties, can be incorporated with the new guidemounted security devices. This versatile design affords you the ability to utilize padlocks, cylinder locks or both. DOOR CURTAIN: The 26 gauge corrugated door curtain is manufactured from full hard galvanized grade 80 steel and coated with Super Durable polyester paint that is backed by a 40 year film integrity and 25 year no-fade limited paint warranty. Available in sizes up to 10’0” x 10’0” and in over 20 different standard colors. Galvanized, guide-mounted HEAD STOPS are simple to install and prevent curtain over travel when raising the door. Installed through guide after curtain is lowered, they provide definite contact with the bottom bar angle and stop clips. The RATCHET SPRING TENSIONER ASSEMBLY is factory installed on the end of the door axle and allows precise fine tuning of the initial spring tension. Increments of 1/8 turn are possible. Tensioner adjusts both springs equally at the same time from only one end of the door. Roll formed clear acrylic coated galvanized steel BOTTOM BAR reinforced with a 1-1/2” x 1-1/2” 14 gauge full width galvanized angle that extends fully into the guides. The PVC bulb astragal provides positive contact with floor. Lift handle(s) and stop clips installed on exterior side of bottom bar and a non-rotting pull rope is attached to the inside angle. Oil-tempered helical torsion SPRINGS are factory lubricated to minimize friction and corrosion while increasing the spring cycle life. Spring wire confirms to ASTM A 229. Full width galvanized steel BARREL totally encloses the drums, springs and axle. 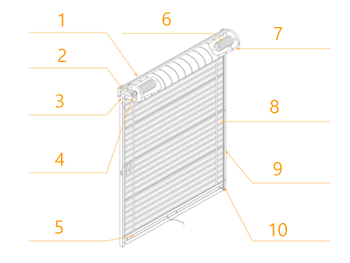 Barrel-type construction reduces door sag, eliminates drum dents and improves operation due to an even support of the curtain for the entire width. Galvanized and pre-painted with long lasting Super Durable polyester paint, the 26 gauge CORRUGATED CURTAIN is roll formed from ASTM A 653 grade 80 full hard steel. This premium steel yields greater door strength and minimized curtain damage. Full height felt tape on back of curtain prevents nesting and reduces paint rubbing. 20+ colors are standard, with others available on special order. Available in sizes up to 10’0” x 10’0”. Roll formed, 18 gauge galvanized GUIDES are fitted with dual polyethylene wear strips to reduce friction and muffle door noises. All guide attachment to jamb is performed through the guides without the addition of clips welded to the back of the guide. This gives a neater appearance, increased strength and aids in tight installations. Yellow zinc coated steel or optional stainless steel cover, slide and four attachment bolts are factory installed. The slide exhibits magnetic properties that can be used to activate a guide mounted security sensor. LATCH accepts all industry padlocks, including 7/16” diameter shanks. Provision for cylinder lock included. © 2007 Buy Doors Direct All Rights Reserved.